Drug metabolism determines the fate of a drug when it enters the human body and is a critical factor in defining their absorption, distribution, metabolism, excretion and toxicity (ADMET) characteristics. Among the various drug metabolizing enzymes, cytochrome P450s (CYP450) constitute an important protein family that aside from functioning in xenobiotic metabolism, is also responsible for a diverse array of other roles encompassing steroid and cholesterol biosynthesis, fatty acid metabolism, calcium homeostasis, neuroendocrine functions and growth regulation. Although CYP450 typically converts xenobiotics into safe metabolites, there are some situations whereby the metabolite is more toxic than its parent molecule. Computational modeling has been instrumental in CYP450 research by rationalizing the nature of the binding event (i.e. inhibit or induce CYP450s) or metabolic stability of query compounds of interest. A plethora of computational approaches encompassing ligand, structure and systems based approaches have been utilized to model CYP450-ligand interactions. This review provides a brief background on the CYP450 family (i.e. 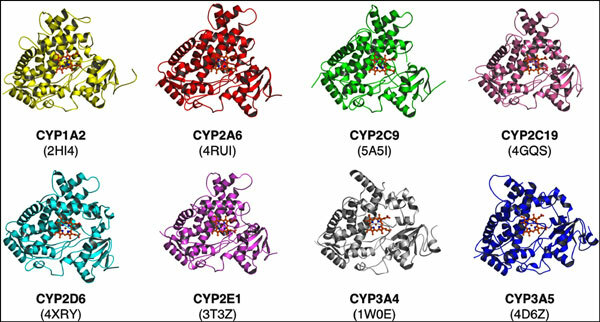 its roles, advantages and disadvantages as well as its modulators) and then discusses the various computational approaches that have been used to model CYP450-ligand interaction. Particular focus was given to the use of quantitative structure-activity relationship (QSAR) and more recent proteochemometric modeling studies. Finally, a perspective on the current state of the art and future trends of the field is also provided. Keywords: Drug metabolism, cytochrome P450, CYP450, ADMET, pharmacokinetics, drug design, QSAR, proteochemometrics. Keywords:Drug metabolism, cytochrome P450, CYP450, ADMET, pharmacokinetics, drug design, QSAR, proteochemometrics. Abstract:Drug metabolism determines the fate of a drug when it enters the human body and is a critical factor in defining their absorption, distribution, metabolism, excretion and toxicity (ADMET) characteristics. Among the various drug metabolizing enzymes, cytochrome P450s (CYP450) constitute an important protein family that aside from functioning in xenobiotic metabolism, is also responsible for a diverse array of other roles encompassing steroid and cholesterol biosynthesis, fatty acid metabolism, calcium homeostasis, neuroendocrine functions and growth regulation. Although CYP450 typically converts xenobiotics into safe metabolites, there are some situations whereby the metabolite is more toxic than its parent molecule. Computational modeling has been instrumental in CYP450 research by rationalizing the nature of the binding event (i.e. inhibit or induce CYP450s) or metabolic stability of query compounds of interest. A plethora of computational approaches encompassing ligand, structure and systems based approaches have been utilized to model CYP450-ligand interactions. This review provides a brief background on the CYP450 family (i.e. its roles, advantages and disadvantages as well as its modulators) and then discusses the various computational approaches that have been used to model CYP450-ligand interaction. Particular focus was given to the use of quantitative structure-activity relationship (QSAR) and more recent proteochemometric modeling studies. Finally, a perspective on the current state of the art and future trends of the field is also provided.